The wind of the Texas Panhandle touches everything in its gusty path. Scattering leaves, fanning flames, and chilling the bones, nature's weathering force remains as constant and powerful as time itself. 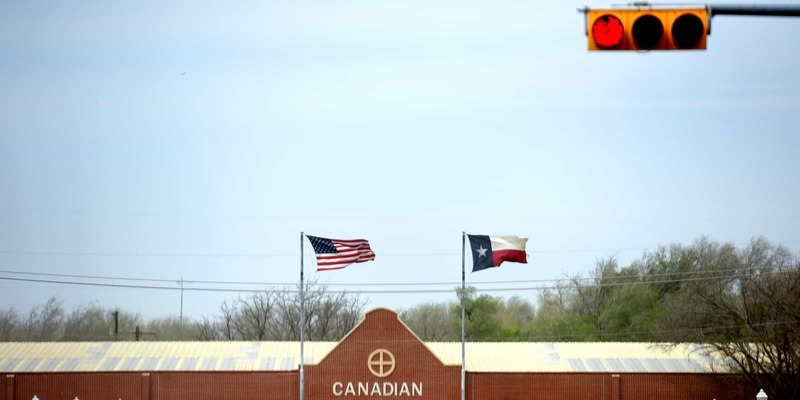 EDITOR’S NOTE: This article is reprinted with permission from the weekly column of Laurie Ezzell Brown, editor of the Canadian Record in the Texas Panhandle. Weathered, what an interesting way to describe the process of aging. I am weathered. I have weathered the years, weathered the storm, weathered the tempests of time. To accept that I am weathered is so much better than acknowledging that I have grown old. Rather than finality, it suggests the process of changing, of adapting, of developing greater character and depth. There is also a calm that comes with weathering—an acceptance—that the seasons will change, the light will shift, the temperature rise and fall. An acceptance, too, that here in Texas, wind is its own constant season, and only rarely rests. My relationship with wind has evolved throughout my lifetime. One of my earliest memories of wind was in the fall, when each wisp of breeze, each shift in the wind’s direction, would shake the branches and add to the mounds of leaves in our back yard—gleaming red and gold—and then send them skittering wildly away, to my great delight. Delight met its test one sunny fall day when my brother David and I set off through the pasture across the street from our house, for a day hike to the mesas south of town. We were young and welcomed the adventure, but had little sense of the distance, nor were we fully aware of weather’s tendency to suddenly change. As we walked, a norther blew in, dropping the temperature 30 degrees in a matter of minutes. We fought the wind all the way home, and in our own over-dramatized minds, felt grateful to have survived. I hated the wind that day. Eventually, though, I began to understand wind’s blessings. It turned the windmill blades, refreshing the stock tank with fresh drinking water. It filled the kite and lifted it skyward. And in the spring and summer, the stronger it blew, the better it kept the insects at bay. Later, I learned how to sail, which changed how I thought of wind forever. I eventually learned that—although I could not defy the wind, and dared not try to tame it—with great patience and time, I could bend to its purpose and make my way home. So as I have weathered, I have also realized that nature’s will is far stronger than mine. In my slowly-acquired wisdom, I have once again made peace with the wind. When wildfires ignited south of town last week—in a haphazard coincidence of drought and heat and wind and wayward electrical spark—I headed down Highway 83 to cover the news. I pulled over to the shoulder as the road disappeared in smoke and dirt, flung open the car door—or did it fling me?—and grabbed my camera. It was then that I fully realized the wind’s power as I tried to remain upright, steadying myself against a power pole at the side of the road and attempting to hold the camera steady while I reeled off a series of photos. Even at this safe distance, the smoke and grit in the air filled my eyes and nose. Confronted with such force, I could not imagine how those flames would ever be halted before consuming half of the county. I thought the following day about the forces of man and nature that had been aligned against each other, sensing that there was some universal lesson in the experience. What I found was this—a meditation on wind written by Bob Killebrew from his rural Hemphill County home, and posted on his Facebook page. He said it all. He said it well. He put me there in that moment. He made me laugh, and he made me appreciate both the earth’s magnificence and the simple nature of we, who inhabit it. I came in early today. Couldn’t take the wind and dirt anymore. It started when I got out to open the gate and a blast of wind grabbed my Stetson and it went rolling across the pasture and finally caught in some mesquites. After I chased that down, I saw four or five old buzzards fighting the wind, but they couldn’t get any lift and landed in the tree row, hanging on to bare limbs with those awful claws. When I finished feeding and was putting away things in the feed barn I saw a dozen really big bumble bees on the ground. They would try to take off and then be pushed back until they gave up and just settled down in the grass! I don’t remember seeing anything like that. On a day like this I am glad for some good news from my wife. Laurie Ezzell Brown is editor of the Canadian (Texas) Record and recipient of the 2007 Tom and Pat Gish Award for courage, tenacity and integrity in rural journalism, presented by the Institute for Rural Journalism and Community Issues.